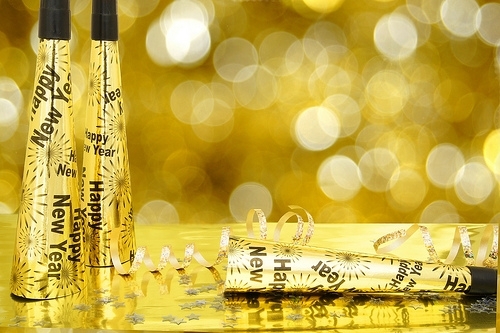 Whether you plan to stay in Riverside, or head out into the crowds to watch the ball drop in Times Square, New Year’s Eve is a time to enjoy friends and family. Send your loved ones well wishes for the New Year, and look for that special someone to share a midnight kiss with for good luck! You’re constantly playing defense. Your child spends two minutes in the morning and two minutes at night carefully brushing and flossing with a fluoride toothpaste. You make sure sugary and acidic foods are not a major part of your diets. Your child visits our Riverside office for regular exams and cleanings. Really, how can a cavity get past all that? Most sealants are invisible plastic resin coatings which we apply in our Riverside office. Usually the procedure is so quick and easy that no dental anesthetic is required. Each tooth will be examined first. If we find any signs of early decay, we will gently treat that area before beginning. Who should consider sealants? Sealants are typically recommended when the permanent molars first erupt. Children’s enamel takes a while to become its strongest, and so these just-erupted teeth are more at risk for cavities. Sometimes Drs. Rick Nichols and Ronald Simus will recommend sealants for primary (baby) teeth if needed. But even adults can benefit—talk to us if you are interested and we will let you know if sealants might be right for you. Make Brushing With Your Child Fun! It’s no secret that kids and adults have different priorities: your duty is to raise a happy, healthy child, but your little one’s only priority may be to have fun. When it comes to brushing teeth, it can be hard to combine a healthy habit with having fun. You might fear it can’t be done, but with a little creativity, brushing time can be a great experience for both of you! Brushing time doesn’t have to be a chore when you throw a little party! Get Mom and Dad together so the whole family can brush their teeth at the same time. Let your child choose a song to dance to while you all brush for the required two minutes. Your son or daughter may grow to love this silly routine, especially when the parents are clearly dedicated to brushing their own teeth as well. Kids love the responsibility of making “big kid” decisions. Keep a variety of toothbrushes, colors of floss, and toothpaste flavors on hand so they can choose something “new” each time they brush, just like when they visit our Riverside office. Not only can this help them grow more comfortable with the idea of seeing the dentist, but they’ll love having the responsibility of picking what would be fun at brush time. It’s true that the only way to get better at something is to practice, practice, and practice. Have your child practice brushing on his or her favorite stuffed animal, and use that opportunity to teach your youngster how to hold the brush and use circular cleaning motions. Showing how you brush your own teeth can also be worthwhile. 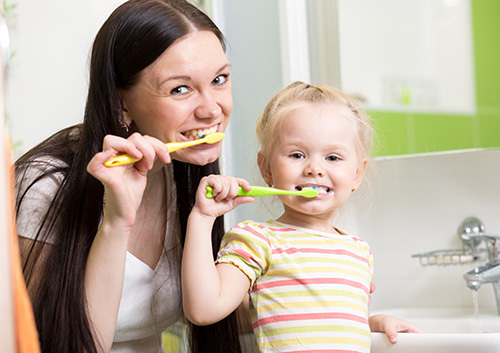 Did you know there are lots of fun apps that encourage good brushing habits among children? Brands like Oral-B and Aquafresh have free apps you can download on your phone. The child gets to select a character, scenery, and a song he or she would love to accompany the task of brushing. If you have a daughter, she might like to use the Tooth Fairy Timer, which allows her to pick her very own fairy as her brushing buddy. The important things to remember when you seek to establish good brushing habits is to keep it fun and stay consistent with your routine. 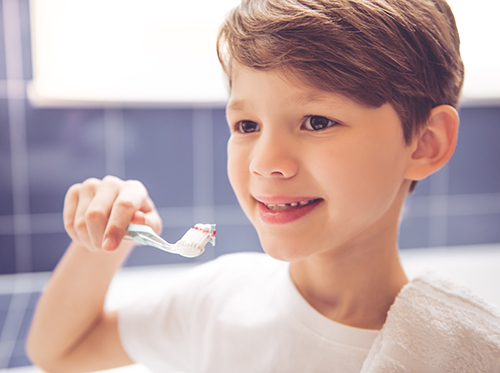 It may take some getting used to, but after a while your child will become familiar with brushing and might even look forward to the new dental routine. Still have questions? 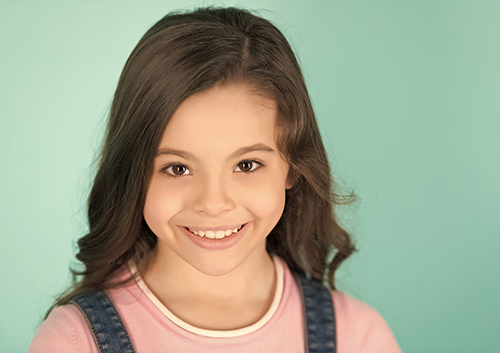 Call our Riverside office and schedule an appointment for your child with Drs. Rick Nichols and Ronald Simus.